With Christ as our foundation and starting point, we return now to the beginning of our story. We start in Eden where all humanity was welcomed into a relationship with God. God offered His presence as He walked amongst His people. Then came the Fall and that relationship was broken. God initiated a plan of reconciliation through Noah, one man and his immediate family, and provided a way for them to reenter this plan and reestablish that relationship. Next came Abraham, who God used to create a nation that He could call His people, His family. Through Moses, a chosen intermediary, an entire nation experiences the grace of God. Finally with Jesus, as in Eden, every son of Adam and daughter of Eve is offered the opportunity to walk with God and experience a personal relationship with their Creator. What do these stories say about God? 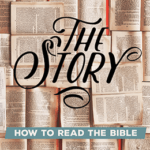 What do these stories teach us about our personal relationship with God? What do these stories teach us about who God is calling us to be?